I’ve spent the whole weekend writing a sermon about the Unitarian Universalist hymnbook for this weekend’s lay service at our church. Now I’ve got hymnal on the brain, and the thought of switching over to folk music makes my head hurt. Which would be a problem, if it were not for the fact that the modern Unitarian Universalist hymnal is about as folk-oriented as a hymnbook gets. It wasn’t always that way. The UU hymnal has gone through several incarnations since the first one was published in 1937. 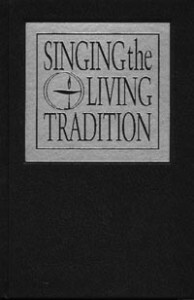 In that time, it has evolved from a compilation of older, mostly traditional hymns and psalms to a populist collection of both original and borrowed songs which reflect the humanist and feminist nature of modern UU practice and the extreme diversity of sources and viewpoints from which Unitarian Universalists find truth and wisdom. UU theology, if we can call it that, revolves around pillars of truth, and the diversity of sources we use to come to them. We don’t get our creed from a single book; we seek out wisdom, adapt it as needed, and share it. “Faith where we find it” is a wonderful chaotic thing, a rich tapestry of truthkernels and wisdom from seekers and worldchangers of all types. As the world changes and evolves, so do the sources we bring in. As is the practice, so is its text. The current UU hymnal Singing the Living Tradition, first published in 1993, is a hodgepodge of folk songs and gospel spirituals, poetry set to old English and shapenote tunes, and biblical texts set to classical melodies. A few psalms remain from earlier ages, and composers such as Bach and Hayden have a presence, but they nestle among songs from sixties folk singers Holly Near and Richard Farina, and modern settings of lyrics from Confucious and Rumi, Emily Dickinson and Sara Teasdale. Martin Luther is there, but so is Duke Ellington. As I will be discussing in my sermon, the current hymnal has some major flaws, mostly stemming from the way in which its songs were selected for their lyrical content rather than any sense of singability. The relative inaccessibility of the songs is coupled by the inherent tension between an everchanging religion which reflects the world-as-it-is and the very commodification of the canon which results from publishing a definitive hymnal in the first place. 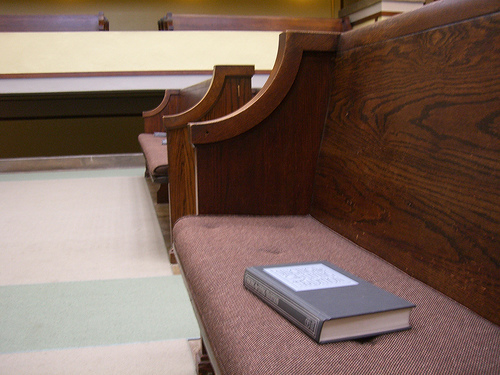 Just fifteen years past its original publication date, the hymnal is already seen by many practitioners and seekers as far out of date, and desperately in need of renewal. But as a source for congregational song, its very diversity makes it an apt collection, allowing each congregation to find their favorites. And as a reflection of folk culture and spirituality, Singing the Living Tradition is a powerful marker of how songs survive through community practice. Here, to prove it, are some folk versions of just a few hymns from the UU hymnal. No matter what you believe or practice, the odds are good you’ll recognize most of ‘em. Cover Lay Down publishes new features and coverfolk each Sunday and Wednesday. Daniel Johnston, The Magnetic Fields, Big Star, Van Halen, and more! A resurrected post today, while I write finals for my graduating seniors and wrestle with something of significance for the weekend. The following feature was originally posted Feb. 23, 2008; it was subsequently removed by blogger. I was a high school student in Boston during Mary Lou Lord‘s busker days, and not an apt or dilligent pupil; I often skipped class to head off down the T into Harvard Square with friends. Given our relative age, then, and her own preference for playing along the Red Line, I suppose I must have passed by Lord a couple of times. But back then, my ears were full of post-punk grunge, and she was just another streetcorner kid with an acoustic guitar, a ragged approach, and an innocent, little-girl voice. 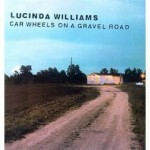 By the time she started recording alongside the best of the growing post-punk world, I had already moved on. 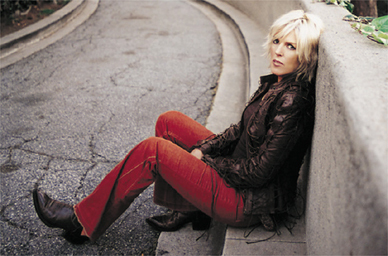 Officially, Mary Lou Lord stopped performing and recording in 2005 when she was diagnosed with a rare vocal cord affliction, though an appearance at SXSW 2006 suggested she’s still open to possibility. 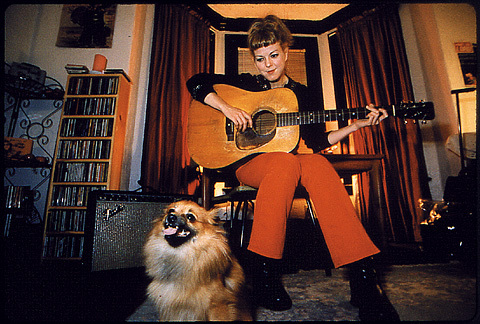 Her recorded output was scattered across several indie labels, some short-lived, but some of her back catalog is still available, and it’s chock full of folk covers. Folk fans are probably best served by starting with Live City Sounds, a hard-to-come-by acoustic album with several Richard Thompson covers which sounds like the streets where I once passed Mary Lou Lord. Alt-punk label Kill Rock Stars also still carries an EP and a couple of compilations; the EP is a split bill with someone else, but it’s got a great rockabilly cover of a Lucinda Williams tune that’s well worth the cost. 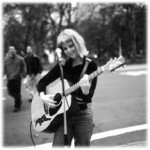 Her myspace page also has a few downloads, including I Figured it Out, a tune she wrote and recorded with Elliott Smith. What, more? Okay, here’s a couple more Big Star coversongs in the same grungefolk vein. Dando’s cover is one of my favorite coversongs ever, hands down. 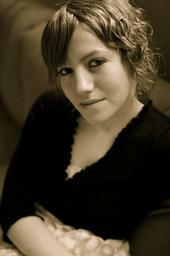 And doesn’t Mary Lou Lord sound like a female version of Elliott Smith? Thanks for humoring me, folks. We’ll return with a brand new coverfolk feature on Sunday. 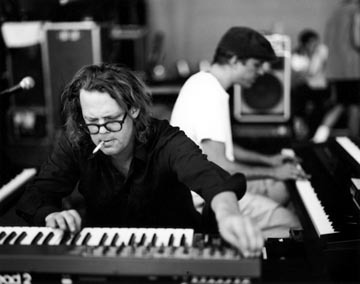 Jay Bennett, solo artist and member of Wilco from 1994 to 2001, passed unexpectedly today at the age of 45 after hip surgery of unknown causes. Bennet’s work with Wilco was often tense — he and frontman Jeff Tweedy didn’t always get along, and he fought famously with Billy Bragg about how best to frame Guthrie’s borrowed works during the Mermaid Avenue sessions — but his production, songwriting, and versatile musicianship helped define what many consider the band’s best era. 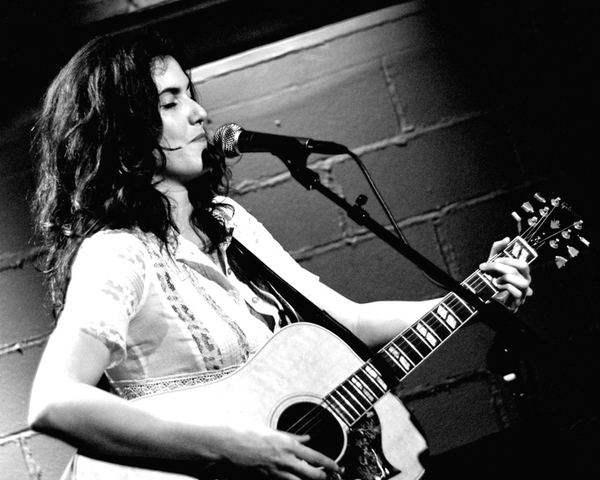 Though their work found its listenership clustered around indierock and alt-country radio, it is no accident that the first Mermaid Avenue release was shortlisted for a Grammy in the Contemporary Folk category. Bennett’s work, with and without his famous bandmates, ranged from powerpop to alt-country, but I believe it has an acoustic heart, just as Bennett did; listen to the ragged troubadour grunge of Another Town Another Ride Another Window, or the breathy blues of Daniel Johnston cover Wicked World — both from his most recent solo disk Whatever Happened I Apologize, available for free download in its entirety here — and you’ll hear what I mean. Nice tributes have already started to crop up elseblog; more, surely, will follow. I don’t have any Bennett solo covers on me at the moment, but here’s a few of my favorite Wilco covers that bear his subtle mark, in memoriam. Jerome and Lori Anna, my two graduating ROTC seniors, are still just kids, off to Prom on Thursday, on the cusp of graduation. Their lives are ahead of them, but their choices are limited. For them, service is a way out of the inner city, perhaps the only one available to them. It will pay for college, and help them focus their abilities. It will give them a future. Cover Lay Down posts new coverfolk features every Sunday and Wednesday. Coming soon: a rundown of coverage from this year’s folk festivals, and a long-overdue look at some recent and upcoming releases. 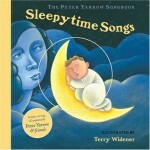 Favorite Folk Songs and Sleepytime Songs, the first two installments in the Peter Yarrow Songbook series, recently arrived in my house, and my children enjoyed them so much we’ve switched over to an all-folk format — at bedtime, at playtime, all day everyday by listener demand. It’s validating to be asked to sing Golden Vanity to my child as she falls asleep, and a relief to put aside the Disney tunes and the circus polkas which generally fill the house. But Yarrow and his collaborators get all the credit here: their new book-and-CD sets are marvelous treasuries of well-selected folk for parents and kids to share, full of Terry Widener’s bright and detailed folk-art illustrations, rich and gentle with acoustic tracks that invite us to sing along with Yarrow’s warm voice, and daughter Bethany’s harmonies. The timing is good, too, developmentally-speaking. The idea of songs as narratives, and the collapse of the distinction between story and song which it assumes, seems to follow the establishment of each as a separate text in my children’s world. When they were smaller, things happened in stories, but songs were repetitive and ecological, naming body parts or counting down lost ducks and bed-jumping, head-thumping monkeys. But at almost-seven, my elder child is reading Harry Potter, excited about plot as much as characterization; her younger sister, just turned four, is starting to transcend songs of mere movement or counting, seeking out songs with sing-along choruses which are actually about something. The wee one, especially, likes Yarrow’s songbooks, using the images as locators and reference for each song; they help her understand the story while her sister and I read the lyrics and sing along. 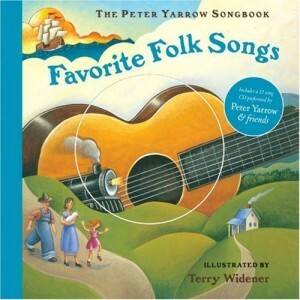 And the tablature and commentary on each song’s history at the end of the book are perfect resources for those with inquisitive children, helping us flesh out the folkways, bringing the songs into our lives in active ways as children’s minds, sense of ownership, and sense of narrative evolve. The subject material in older storysongs from the folk tradition can be surprisingly violent, and many of the songs which Yarrow has chosen are no exception. The classic songs which have made their way into the kidfolk canon may be, fundamentally, stories of animal tricksters and sailing ships, but they contain barely submerged themes of theft (The Fox), folly (Stewball), hubris (The Cat Came Back), death and betrayal (The Golden Vanity). But our kids live in reality. They’re at an age where it’s okay to be honest about the way the world really works, and they come from an age which no longer cries at Bambi’s mother’s death. Nurturing their sense of narrative, creating a sense of causality; the success of such vital lifelessons depends on an understanding of risk, and high stakes frame that risk in broad strokes which a child can see. My children have experienced death and loss, and we owe it to them as deliberate parents not to sugarcoat the universe any longer. Today, then, we return to our covered in kidfolk series with a curated set of folk and roots versions of some classic storysongs which — though they may not have been originally designed for kids — continue to find their way onto children’s collections, as parents and wise elders pass along the folkways. Plus covers of a few more modern folksongs of the narrative type, which come off as surprisingly tame by comparison. Two versions of the song that started it all for our household: the first a relatively mellow take from Peter Yarrow’s collection which emphasizes the story, the second, from mandolinist and family friend Peter Siegel‘s 2004 release The Show, is a joyously raucous hootenanny that evokes the pirate betrayal at the song’s heart. We’ve heard this one around the house for years, but it took Terry Widener’s vividly detailed illustrations to help my younger daughter realize that there was a plot involved. Here, now-defunct newgrass trio Nickel Creek takes it fast, emphasizing crisp wizardry and technical trickery; the Waco Brothers come out fighting dirty, slamming through the high-paced events of the evening in all their grungy, punkabilly glory. Sometimes Dylan-the-storyteller gets it right without hardly trying, as in this track from 1992 release Good As I’ve Been To You. Meanwhile, frequent kidfolk celebrant Elizabeth Mitchell‘s lazy, languid take reveals a swampside ambivalence about the whole courtship process, from engagement to wedding party. Doc Watson‘s take on this adopted bluegrass standard is warm and practically jolly, but the song has a hidden weight, and not all of it comes from the weary age we hear in Watson’s voice. It took me thirty five years to realize that this song isn’t about a clock at all. There’s no particular reason to count this as a kids folksong, but played as a quiet ballad, it fits perfectly among the sunny acoustic sessionwork of Dave Grisman and Jerry Garcia’s Not For Kids Only, a longtime bedtime favorite. It’s easy to forget that Noah’s Ark is as much an extinction story as it is a story of selection and survival. In their take on this tune originally written by poet Shel Silverstein, popular filk-song parodists the Brobdingnagian Bards pour on the melodrama, but it’s done with a wink and a nod. Perhaps the most recent in origin of all of today’s songs, this early James Taylor tune takes on a reeling party flavor in the hands of indie duo Mates of State and what appears to be a small crowd of yelling preschoolers. The cover comes from the most recent of those great For the Kids indie compilations, which support and provide music education in US and Canadian schools. The familiar tale of horserace gambling takes on an unusually slow, sultry, slinky tone with the addition of percussive mandolin, floating fiddle, funky beat and fat bass. From Gambling Eden. A playfully silly old-timey country take from another local recording artist, music-in-the-schools proponent and worldchanger Dr. Watson Reid. My kids love the way the song gains speed and momentum, accelerating into itself, like the train bearing down on Bill Grogan’s willful goat. A traditional favorite and a newer classic from the Yarrow Songbooks to cap the entry off; Yarrow wrote Puff before he joined Paul and Mary, but the PP&M version is definitive, so we’ll let it sneak through the filters. 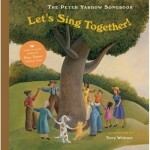 Thanks to Sterling Children’s Books for the opportunity to celebrate these marvelous treasuries, and permission to share multiple tracks from the Peter Yarrow Songbook series with you. Get the books at amazon, or handle ‘em actual size at a local children’s store worth supporting — they make great baby gifts. Keep an eye open for volume three, Let’s Sing Together, which is due out in August. And if you’re a parent or educator interested in using folksong to help kids create a more compassionate, respectful world, don’t forget to visit Operation Respect, which Yarrow founded in 2000 to do just that. The site features curricula, audio downloads, interviews and more, including tracks from both songbooks. As always, all of today’s songs, and the albums they appear on, come fully endorsed and recommended by cool folkdads and indiemoms and their free range children. Whether you’re a parent, or just in touch with your inner child, follow links above to learn more about the artists we’ve celebrated today, and purchase their albums — the better to fuel the fire of folk, for your children’s sake. I have a strong memory of being halfway up the Falcon Ridge Folk Festival Hill, the sun setting, the stage small in the distance, trying to figure out what people see in Richard Thompson. The man was clearly a legend, and a draw indeed; the hill was as full as I’ve seen it. But that voice, and the signature solo electric guitar, echoed off the hills like a sour note in my ears. I wandered off to put the kids in their bunks, and tucked Thompson away in my mind for another day. We’ve hemmed and hawed around the subject for a while here at Cover lay Down, from our early feature on son Teddy Thompson to a half-pint feature on 1952 Vincent Black Lightning way back in August. 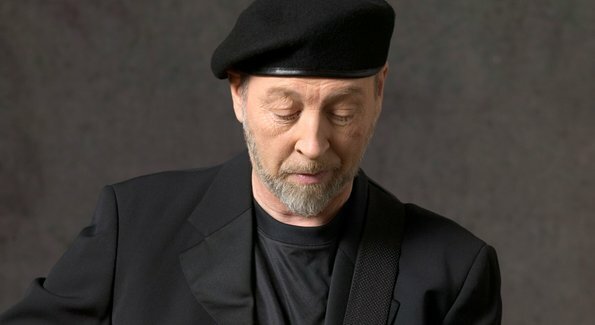 In fact, on average, covers of Richard Thompson songs have cropped up at a rate of one per month — a high percentage indeed for a blog that only posts twice a week. But regular readers may notice that though his songs are legion here, Richard Thompson’s own voice has only shown up a few meager times, for live covers of Britney Spears and Squeeze classic Tempted, and for his Donovan cover from the Crossing Jordan soundtrack. For a guy who has had such an impact on modern folk music on both sides of the pond — both for his work with the definitive sixties British folk rock group Fairport Convention and his subsequent career as a solo artist — and who has been so prolific in both stages of his work, it’s almost an embarrassment to have stayed at arm’s length for so long. My bias against Dylan, Michael Stipe, and other practitioners of a particular type of nasal, pinched male folk voices is well-cited here at Cover lay Down; much of my long-standing resistance to Thompson’s music, surely, is due to the peculiar grating timbre of his voice. Too, his particular sound is so distinctive, it can easily be mistaken for sameness — that loose-tempoed strum, that too-often invariant volume, that strangled, raw-pitched yelp held loud and long. But looking back, my bias for Thompson’s songbook is so obvious, and the field so rich, I’ve given myself a few days to try on the songs themselves, figuring that if they were truly that unlistenable, the man would never have become one of the most covered folksingers living today. And you know what? After steeping myself in his vast back catalog for just a few hours, I think I’m catching a glimmer of the power already — something about the tension between the little-boy longing in his heart, the beauty of the language he finds to express himself, and the authenticity it takes on when held in tension with the sound and fury of the performance. I suspect I’ll always favor the covers, and not just because it’s my raison d’blog. Specifically, I find his language and melodies especially well-served by tender coverage, though like the originals, versions “out there” range from rockers to ballads. And since friend FiL sent along two generally solid tribute albums a while back — one a rocker, the other a delicate collection of freakfolk and neofolk — there’s plenty of fodder, both reposted and newly-found, to select from and share. But like once-bitter coffee or a fine IPA, the man’s finally starting to grow on me. He may not turn out to be the musical love of my life, but I’m willing to find my peace with the guttural performance of this bittersweet poet of factory and field, apt chronicler of loves lost and discovered and lost again. While I spend a few more hours with the originals, here’s just a small sampling of the Thompson-penned covers I’ve grown to love best in a lifetime of resistance. As always, folks, Cover Lay Down exists to spread the word about artists, not just share the tunes and thoughts. If you enjoyed one or all of today’s sampler platter, follow album links to pick up your very own copies of tribute disks and more direct from artist websites and other local, anti-corporate sources. 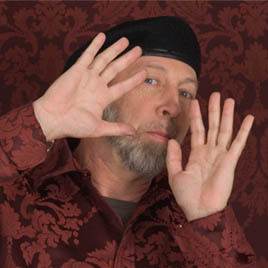 And if you’re interested in joining me on my aural pilgrimage to learn more about the nigh-immortal Richard Thompson, head on over to BeesWeb, Thompson’s well-designed website, for purchase links, samples and more. The lyrics are sheer poetry, too, worth reading as verse on their own merits. As the past recedes, the process of discovery and uncovery continues unabated. Though what’s written is written, mailbags still swell, and readers still follow up on our work here at Cover Lay Down with news of covers from far and wide. Happily, there’s (Re)Covered: an ongoing feature in which we return to subjects gone by in order to continue to bring you the newest and the best in coverfolk. Today, our tenth installment in the popular series. Cover Lay Down was one of the first blogs to tout Arrica Rose last year; it was hard not to rave, given how well her cover of Tom Waits stacked up against the competition. Now, after a year building buzz with the likes of Paste Magazine and iTunes on the strength of her previous full-length outing La La Lost, Arrica Rose is back with Pretend I’m Fur, a seven song EP rich and consistent enough to stand in for a full album, and though it doesn’t drop until Monday, I just couldn’t wait to spread the word. Less grungy and a little more introspective than Arrica’s last outing, Pretend I’m Fur is deceptively gentle on the surface, but as before, there’s a poetry of strength driving the songwriting, and the shimmery indiepop production that producer Dan Garcia brings to the project is a perfect complement to Arrica’s fragile, gorgeously broken voice and confessional lyrics. The result is a stunning EP that rings of the best of Feist, Lisa Loeb, and Melissa Etheridge all at once. I especially like the Bee Gees cover; it’s playful and sweet, with more than a hint of Etheridge in its understated guitarpop production and vocal style. As with Arrica’s Tom Waits cover, it offers a perfect deconstruction, breathtakingly transforming the tragic disco ballad into something intimate, full of longing and eminently radio-ready. Check it out, and order Pretend I’m Fur direct from Arrica’s website. Bonus Bee Gees coverfolk: Shawn Colvin covers the Bee Gees, too. Not sure how I missed this in our previous feature on Bee Gees covers, but that’s what the (Re)Covered series is for, I suppose. After a full feature on some new newgrass voices just last week, I’ve got newgrass on my mind again tonight after an absolutely incredible double feature with The Boston Boys and Joy Kills Sorrow, a pair of quintets hosted by the Boston-based, not-for-profit Notlob Folk Concerts series. We’ve posted a cover or two from Joy Kills Sorrow here before, but I continue to be enamored of both their overall sound and their new lead singer Emma Beaton, who I first wrote about after this winter’s Boston Celtic Music Fest, and who has just dropped some new stunning originals and JKS tracks at her MySpace page. The Boston Boys have just finished recording their debut album, so watch this space next month for a cover or two from the high-energy rockgrass band — I’m especially curious to see if the Otis Redding song they covered tonight will have made the cut, and disappointed that there’s nothing to offer here, but their MySpace page offers a pair of tracks worth hearing. While we wait for new disks from tonight’s featured artists, here’s a pair of previously-posted tracks well worth reviving: A Joy Kills Sorrow cover from their first album, before Emma Beaton came on board, and a tradfolk tune featuring Emma and three members of The Boston Boys: Sam Grisman on bass, Eric Robertson on mandolin, and Stash Wyslouch on guitar. Bonus Newgrass coverfolk: friend and fellow Falcon Ridge folkie Stacey sent word of a brand new Beatles cover from Bearfoot, yet another newgrass quintet who she saw down in Boston yesterday. Stacey’s recommendations are always good, and this one, from their brand new album on Compass Records, is especially sweet and lovely. I’ve said it before, and I’ll say it again: one of the things I love best about keeping this blog is you. Case in point: these two surprisingly different covers of an oft-covered and seldom-transformed tune which were sent in by reader Joe after last month’s Single Song Sunday feature on Who Knows Where The Time Goes. 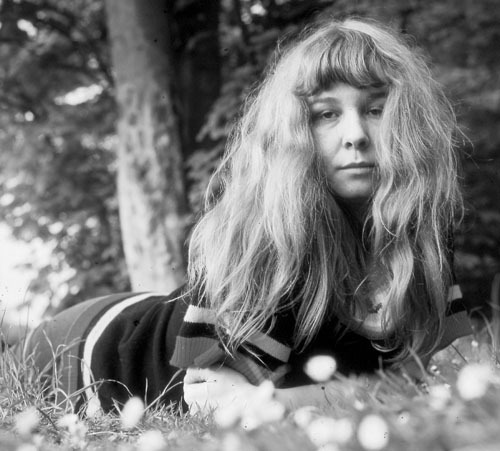 Jazz siren Deanna Kirk‘s pianopop changes up the beat on Sandy Denny’s signature song just enough to provide a pulsing push, replacing wistfulness with mere distance; Dutch singer-songwriter Linde Nijland echoes earlier acoustic covers from Kate Wolf and Joni Mitchell, but with a still-lighter touch, focusing the song and simplifying it by hardly straying from a single vocal octave. Finally, and in other covernews, Wears the Trousers streamed a set of covers from altfolk siren Marissa Nadler last week; from there, Stranger Dance compiled the list in mp3 form, and adds the originals of each for comparison’s sake. Nadler’s neofolk is gorgeous, and though we did post a few tracks of hers here before, I’ve been meaning to talk about her in more depth for a while now; I’m jealous that someone else got there first, but happy to pass along my highest recommendation for both the blogs and the artist. Cover Lay Down publishes new coverfolk features Sundays and Wednesdays. Coming soon: a long-awaited return to the world of kidfolk. Here at Cover Lay Down, we pride ourselves on our diligent publishing schedule — twice a week every week, Wednesdays and Sundays without fail. Which makes it all the more embarrassing to have passed out on the couch just after supper last night, never to return to full-bore consciousness until the morning light hit the window, warning me of impending tardiness. To be fair, it’s been a long week already: parent meetings and a full-period professional development session between classes on Monday; a day out in the rain Tuesday teaching a handful of young but eager underachievers about the laboring trades, including hands-on experience in welding, backhoe driving, glass cutting, carpentry and bricklaying, at Construction Career Day out in Hopkinton. 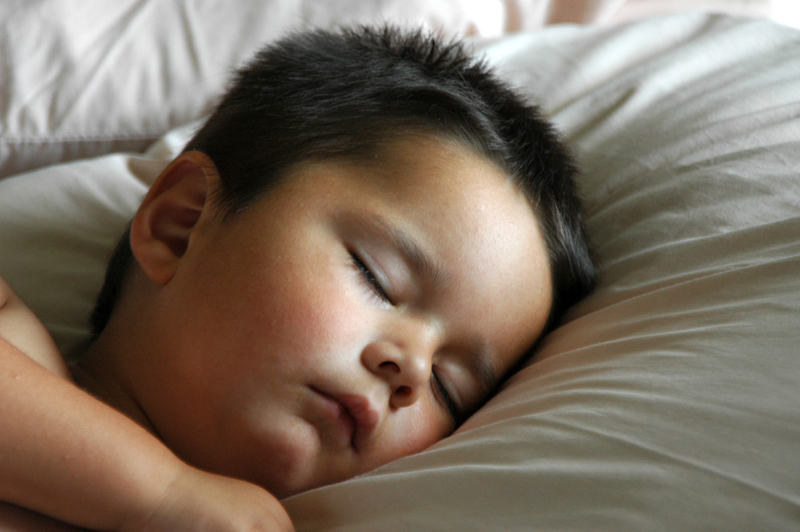 Then tonight’s school committee meeting went long, and…well, you know how time gets away from you sometimes. Now here it is, just an hour or two before deadline, and I’m scrambling to stay on track. I could let it go, I suppose — take the easy way out, maybe finally repost that long lost Mary Lou Lord coverset that Blogger deleted back before we moved on to our own domain, or dig up last year’s tribute to the teaching profession in honor of National Teacher’s Appreciation Week. But I believe in Seth Godin’s admonition that the best way to beat the rut is to do the work. Plus, I just did a partial repost on Sunday, and I’ve got a sneaking suspicion that there’s going to be a time and place for both schoolsongs and Lord’s grungefolk coming up in the next few months. Which is to say: sorry for the eleventh hour post, folks, but never fear — there’s music here for everyone, from tradfolk to contemporary folk to the experimental side of the indiefolk world. In compensation for the mundania, the brevity, and the last-minuteness of the writing, here’s a full set of favorite folk coversongs about sleeping in, sleeping on, and dreaming the night away. As always, if you like what you hear here, please follow artist and album links to purchase their work. After all, I may have flaked out for the evening, but I’m an amateur. The artists we celebrate stay up late, working to get the tunes down for our benefit. 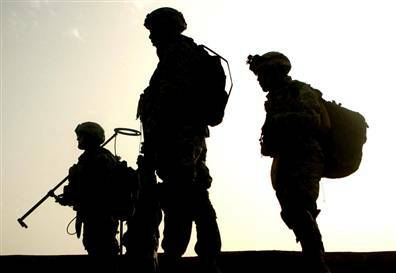 For this, they deserve both our respect, and our support. 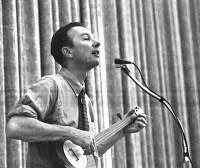 Seminal folk revivalist, labor organizer, five-string banjo master, and champion-of-community Pete Seeger turns ninety years old today, May 3. In his honor, folk venues across the country are hosting singalongs and fundraisers under the umbrella concept of For Pete’s Sake, Sing, with all profits to benefit Clearwater, the educational and environmental organization which Seeger founded a few decades ago to clean up the Hudson River north of New York City. Acoustic Music Scene has a relatively comprehensive list of local hootenannies and group sings participating in the global celebration. The “big” event is in NYC, of course, at Madison Square Garden. If you’re lucky enough to live in or around the area, there may be a seat or two left at tonight’s primary tribute concert, which will feature a veritable who’s who of folk and rock musicians with a strong sense of social justice who look to Seeger as mentor and a muse, from Bruce Springsteen, Eddie Vedder, and Dave Matthews to Dar Williams, Ani DiFranco, and Bruce Cockburn (full list of the participating artists is available here). Seats are dear, but it’s for a good cause. Even if you can’t make it out to celebrate in sing-along style, take a few minutes on Sunday to consider the great works and impact of this world-changing musician and activist. To get you started, Muruch has links to Buffalo Gals and Oh Mary Don’t You Weep, a pair of traditional American ballads from Seeger’s back catalog, courtesy of Smithsonian Folkways, who just released American Favorite Ballads Vol. 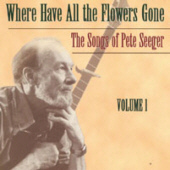 1-5 — it’s all Seeger, and the track list is a veritable survey of his impact on the modern traditional folk canon. The Spring 09 issue of Folkways Magazine offers a spotlight on Seeger’s career, too, from his long sufferance as a blacklisted pro-labor artist to his particpation in the civil rights movement of the sixties to his more recent environmental advocacy work. And here? Why, we featured Pete way back in September 2008, just before Cover Lay Down moved to its own domain, and put up a few more Seeger covers and a video when he performed This Land Is Our Land at Obama’s inauguration. Rather than diminish the power of our original paean to this great revivalist of the old folkways, I’m reposting the first of those features below — but I’ve added a few more covers, just to keep regular readers happy. 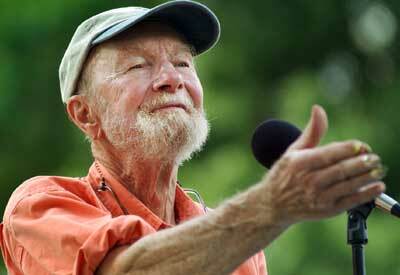 Oh, and there’s no purchase links today; Seeger wouldn’t want it that way. Instead, if it moves you, why not donate to Clearwater? Cover Lay Down posts regular features every Wednesday and Sunday. Coming soon: yet another installment of our popular Kidfolk series, and a tribute to mothers everywhere.